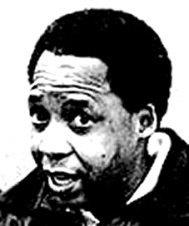 Chris Hani was born in 1943 rural Transkei. He matriculated from the Lovedale Institute in 1958 and went on to study at the University of Fort Hare and later Rhodes University, Grahamstown. Here he received a BA degree in Latin and English. He attempted a legal career but abandoned this for a career in the politics of liberation. Hani joined the African National Congress Youth League (ANCYL) in 1957. In Cape Town Hani became involved in the South African Congress of Trade Unions (SACTU). He also joined Umkontho We Sizwe, the ANC's military wing, which was banned in 1960. In 1962 Hani became part of the leadership of the wing in the Western Cape. While out on bail, after his second arrest in 1962, Hani went underground. He went to Zambia to receive military training and became Commissar of the famous Luthuli Regiment of Umkhontho we Sizwe in 1967. Hani re-entered South Africa secretly in 1973 to establish an underground infrastructure for the ANC in the Western Cape. He moved to Zambia, where he was appointed Deputy Commander of Umkontho. By 1987 Hani had become Chief of Staff of Umkhontho. Hani returned to South Africa in 1990 and remained an insurrectionist. He was persuaded by the wisdom of Mandela's approach and began to play an active and important role in political developments leading to a democratic social order. He became a member of the Politburo of the South African Communist party (SACP) when Joe Slovo retired because of ill health. Hani became Secretary-General of the SACP in 1991. Chris Hani's popularity with the masses, especially the youth, was legendary. On 10 April 1993 Hani was shot dead outside his Boksburg home by Janus Walus, who was jailed with Clive Derby-Lewis for the killing.